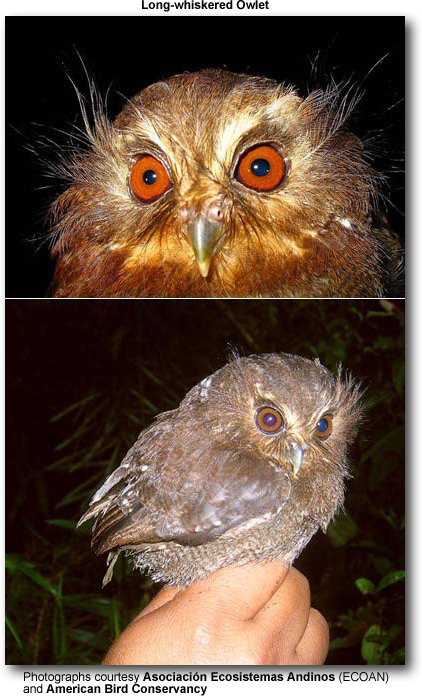 The Long-whiskered Owlet, Xenoglaux loweryi is a rare owl that is endemic to limited areas in the Andean mountains in Amazonas and San Martín in northern Peru. Its preferred habit includes the cloud forests with dense undergrowth and epiphytes at about 6,200-7,220 ft (1,890-2,200 meters) above sea level. Its genus name means "Strange owl." At 5-5½ in (13 to 14 cm), this owl is not much bigger than a human fist. It is one of the smallest owl in the world. Its plumage is mainly brown with a whitish belly and eye brow. It has distinctice whisker-like long facial feathers that extend out past its head and big reddish-orange eyes. This outlet was first discovered in 1976. It was spotted for the first time in the wild in the Peruvian jungle in March 2007. Ornithologists believe only between 250 and 1,000 of the tiny animals, which occupy their own genus "Xenoglaux,' exist on the planet. Not much is known about this small owl as it is possibly the rarest owl species. Very few records exist and it is listed as an endangered species, and would qualify as Critically Endangered if it were not known from two locations. A tiny bird so rare and unusual that its scientific name means "strange owl" was spotted for the first time in the wild, scientists announced on March 22, 2007. Conservationists working in Peru got their first natural glimpse of the long-whiskered owlet in February 2007 while working in a private mountain reserve. The species wasn't even known to exist until 1976, and since then the only known living specimens have been those caught in nets at night. "Seeing the long-whiskered owlet is a huge thrill," said David Geale of Asociación Ecosistemas Andinos, who was part of the research team, in a press statement. The American Bird Conservancy, which partnered in the research, described the sighting as "a holy grail" of bird biology. As few as 250 of the owlets are thought to exist, scientists said, and the birds are as distinctive as they are rare. With their diminutive size, bright orange eyes, and wild, wispy facial feathers, the dainty birds belong to their own genus, dubbed Xenoglaux, or "strange owl." The owlets owe much of their survival to the remoteness of their dense mountain habitat, the researchers said. But as human activity encroaches on Peru's northern forests, the birds' future looks dimmer. "Due to the rapid destruction of its forest habitat and its tiny range, it is inferred that the species is in serious decline," Geale said. "Until recently, the owlets key habitat was completely unprotected."